Spend Lobster Season with Capt. Jason in the Florida Keys! Jump in and grab dinner! Florida’s spiny lobster are amazing on the grill, and catching them yourselves is a blast! There’s no giant pesky claws to look out for. Simply dive down, find the lobster, and “tickle” him into your net. the next step is to head back to the dock and cook! It’s that simple! Lobstering in Key West is fun for everyone; families, corporate outings, bachelor parties… you name it. Lobster season is like a big party where everyone is diving in and coming up with some of the best seafood that Florida has to offer. Capt. Jason offers seasonal lobster trips. Call him today to discuss when to go and where he runs his lobster charters. Considering making the drive down to the beautiful Key West area? Key West is a paradise where the drinks never run out and home to Florida’s best-kept secret, Florida Lobstering. “The Spiny Lobster” is just below the water line in nearly every ledge and hole. 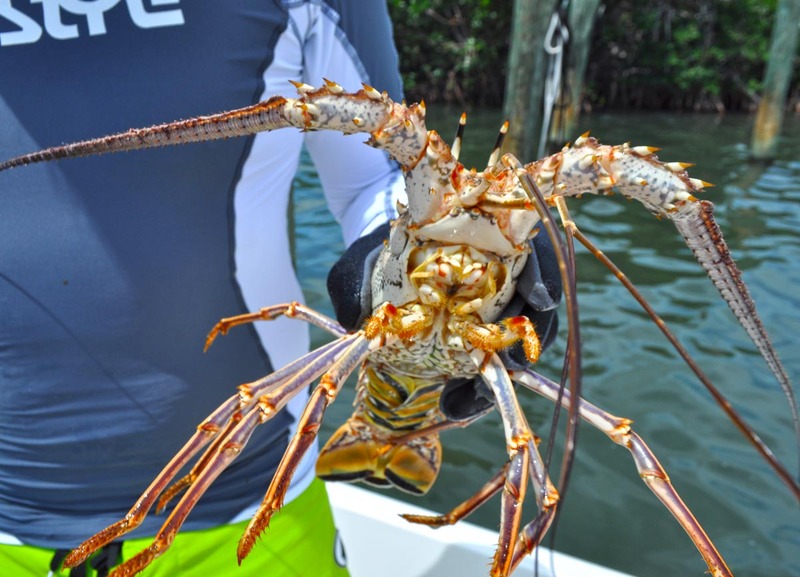 The greatest part about being able to catch Florida Spiny Lobster is that they’re delicious table fare and can be caught by nearly anyone that knows how to swim. If you’re the adventurous type and love to boat, feel free to bring down your boat. Hop on the boat and let me do all the work, Just kick back and relax and soak up everything special that The Florida Keys has to offer. Bring the whole family. The Florida keys is rich in history with many State Parks to catch breathe taking views of the Famous 7 mile bridge. The Florida Keys is the perfect paradise to take your whole family. With plenty of shopping and quaint diners to make sure that the wife and kids will have plenty of things to keep them busy if they choose not to go after lobster or fishing during your trip. Here is a list of some of my favorite places to visit while I’m down in Key West. I pretty much always order their homemade Corn beef hash and a one of a kind house-made bloody mary. Everything I have ever eaten here is delicious and perfectly seasoned. Price: Tourist pricing is in full effect. I have eaten pretty much anything on their menu. If hangover cure food is what you’re looking for stop by and I’ll see you here. Best Gourmet Grill Cheeses on the island. Pricing is fair for it being a diner on the side of a bar. Hands down this place has the best Cuban food north of Havana. Authenticity and attention to detail make this off the beaten path place a must go to when you’re anywhere within 45 minutes of key west. My personal favorite menu item is the El Seboney Steak. Come on an empty stomach because the portions and flavor is huge. Here is where everyone has a different opinion. I find myself in a never-ending wanderlust once I hit Duval Street. The main nightlife hub of key west. I will keep this brief because there could easily be another whole article on key west nightlife. The Porch for homemade spirits and cocktails. Schooner Wharf to drink with the old salts of key west. Ricks to get your dance on until the wee hours of the morning. I have been visiting Duval street for years and every year it still amazes me how so little changes down here. The nightlife never seems to miss a beat, and When I walk into a bar it’s like the party never stopped. It is truly one of the best places to have a libation in America.